Greek mythology family tree | Learn about Greek Mythology,Greek gods,Greek mythology stories! 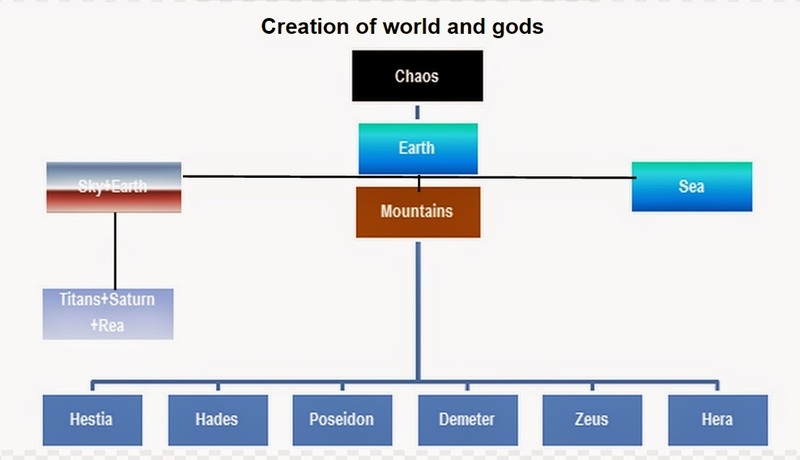 A diagram i created and it shows the family tree of the Greek gods and the begin of all mythology as we know. At the beginning there was only Chaos. Thick darkness was covering everything until out of chaos was born the Earth and from the earth the mountains, the Sea and the Sky, then the Sun and the moon with the stars. Then Uranus(Sky) and Earth were joined and gave birth to the Titans. But Uranus was afraid that some of the kids would take his throne. That is why he imprisoned them in the depths of the earth. But his son Saturn, the stronger among titans, managed to defeat him and became the leader of the world. He married with Rhea and they gave birth to three goddesses and three gods: Hera, Hestia, Demeter, Pluto (Hades), Poseidon and Zeus. the beginning of all mythology as we know. But Saturn also was afraid that one of his children would try to take his throne. So when his children were born he was devouring them. His wife Rhea, being desperate, gave birth to her sixth child, Zeus in a cave at a mountain on the Greek island, Crete. She hid him there, where he was taken care by the Nymphs, by drinking the milk from a goat which was named, Amalthia. Rhea instead of giving Zeus to Saturn she gave him a rock covered with clothes. When Zeus grew up he fight with his father and managed to make him, release his five brothers and sisters which had devoured. That was the beginning of a war among the Titans and the Gods. Lasted for ten years the Titanomachy. Finally, the Gods won and imprisoned the Titans in the Tartarus Then, the Gods fought with the Giants.The Gigantomachy, lasted for a long time and finally the Gods won again. So, Zeus became the ruler of the world. He married Hera and together with his children and his brothers, they moved to mount Olympus.